Newly opened on Morrison Street, Shebeen Bar and Braai sets its stall out front and centre, as you enter the place, up a narrow staircase. The sign before the door reads: “Welkom to Meat Heaven”. Meat is most assuredly what they do, with a menu jam-packed with the stuff. For those not familiar with South African cuisine, in which number I count myself, some of the names of the dishes are unusual, but the types of thing these comprise are entirely familiar. I was joined today by Danielle, of Edinburgh Foody fame. This part of town is a regular lunchtime haunt for us, as Danielle works nearby. Shebeen’s original vision didn’t particularly include opening at lunchtimes. They didn’t think there would be the demand. However, from just a few weeks in their new premises, it’s clear there is, so they’ve had to put together a set of lunchtime offerings, to sit alongside their full a la carte. We settled upon something to share, with the fanagolo sounding like it would hit the mark, with its combination of many items from the menu in one bucket of joy. We had a notion that we might need another item to augment things, but our helpful waiter set us straight that the fanagolo would likely satisfy our requirements. Having left us with the message that as everything is cooked from fresh, it would take a wee minute before things arrived, we had a good window to catch up on all things food related, as well as having time to take in the compact and smartly appointed surroundings. 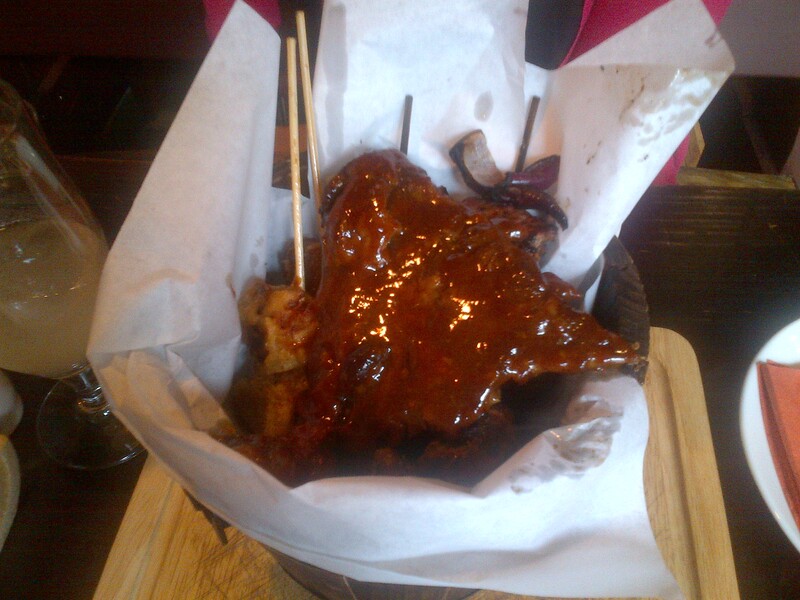 Soon enough, the bucket of meat appeared. Topped with tempting looking ribs, it was a feast for the eyes. 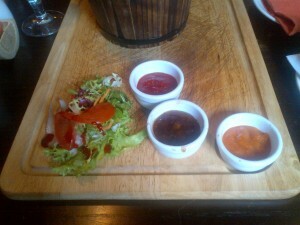 Again, our helpful waiter did a star turn, running us through each item. We had a pork meatball stuffed with mozzarella, a beef meatball, a boerwors sausage each, a beef sosatie each, a deep-fried pork belly sosatie each, and then the lovely ribs to share. The ribs were the undoubted star, packed with excellent flavour and succulent tenderness. The pork belly skewers were outstanding, too. The beef meatball was a little too dry and crumbly for my tastes, but was accurately described as being made from lean mince, perhaps that was the desire effect. 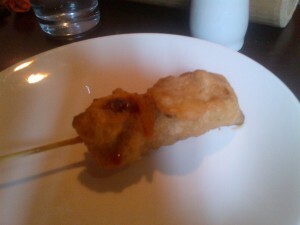 The sausages were suitably rustic and the beef sosaties tasty, meaning that it truly was a bucket of meaty joy. The only criticism was that the items at the top were better than the items at the bottom. This may just be our tastes, or that the lower down items might taste better fresh of the braai, or a combination of both. The bucket presentation is good, so maybe I’d just recommend that you delve in deeply, at the start, to give each item a fair chance to shine, rather than eating consecutively, top to bottom, as we did. We didn’t explore what side dishes might accompany these meaty offerings, but the accompanying sauces need a little work, as they didn’t linger in the memory. 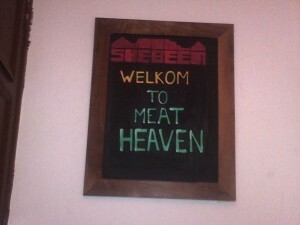 So overall, I was well impressed by the meat heaven available at Shebeen. For the meat lover in your life, this is the place to book for your next lunch or evening out. I’m going to go back, soon, to try their steaks, as I have a feeling they’ll be good, based on the care and attention shown in the preparation of the items we had, today. Veggies…well, this one’s not for you.